Spectrally pure lasers lie at the heart of precision high-end scientific and commercial applications, thanks to their ability to produce near-perfect single-color light. A laser's capacity to do so is measured in terms of its linewidth, or coherence, which is the ability to emit a constant frequency over a certain period of time before that frequency changes. There is a push to move the performance of high-end lasers onto photonic micro-chips, dramatically reducing cost and size while making the technology available to a wide range of applications including spectroscopy, navigation, quantum computation and optical communications. Achieving such performance at the chip scale would also go a long way to address the challenge posed by the internet's exploding data-capacity requirements and the resulting increase in worldwide energy consumption of data centers and their fiber-optic interconnects. In the cover article of the January 2019 issue of Nature Photonics, researchers at UC Santa Barbara and their collaborators at Honeywell, Yale and Northern Arizona University, describe a significant milestone in this pursuit: a chip-scale laser capable of emitting light with a fundamental linewidth of less than 1 Hz—quiet enough to move demanding scientific applications to the chip scale. The project was funded under the Defense Advanced Research Project Agency's (DARPA) OwlG initiative. To be impactful, these low-linewidth lasers must be incorporated into photonic integrated circuits (PICs)—the equivalents of computer micro-chips for light—that can be fabricated at wafer-scale in commercial micro-chip foundries. "To date, there hasn't been a method for making a quiet laser with this level of coherence and narrow linewidth at the photonic-chip scale," said co-author and team lead Dan Blumenthal, a professor in the Department of Electrical and Computer Engineering at UC Santa Barbara. The current generation of chip-scale lasers are inherently noisy and have relatively large linewidth. New innovations have been needed that function within the fundamental physics associated with miniaturizing these high-quality lasers. 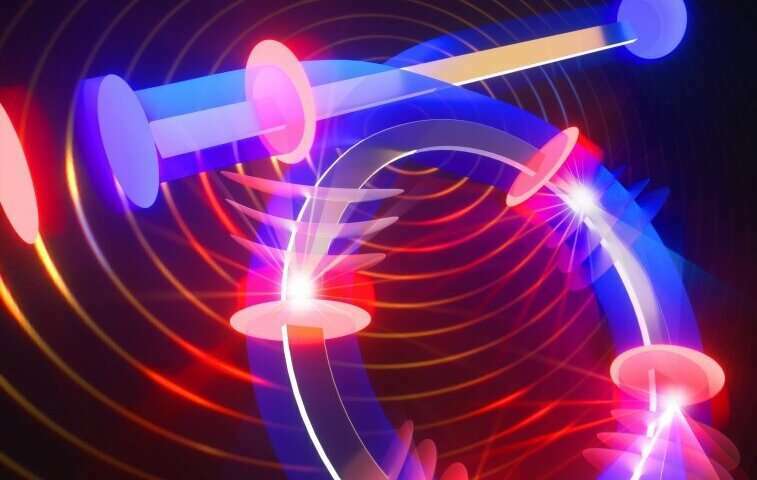 "Our approach uses this process of light-matter interaction in which the light actually produces sound, or acoustic, waves inside a material," Blumenthal noted. "Brillouin lasers are well known for producing extremely quiet light. They do so by utilizing photons from a noisy 'pump' laser to produce acoustic waves, which, in turn, act as cushions to produce new quiet, low-linewidth output light. The Brillouin process is highly effective, reducing the linewidth of an input pump laser by a factor of up to a million." "The key to making our sub-Hz Brillouin laser on a photonic integrated chip was to use a technology developed at UC Santa Barbara—photonic integrated circuits built with waveguides that are extremely low loss, on par with the optical fiber," Blumenthal explained. "These low-loss waveguides, formed into a Brillouin laser ring cavity on the chip, have all the right ingredients for success: They can store an extremely large number of photons on the chip, handle extremely high levels of optical power inside the optical cavity and guide photons along the waveguide much as a rail guides a monorail train." Since being completed, this research has led to multiple new funded projects both in Blumenthal's group and in those of his collaborators. Arghhhh, "impact" is not a verb unless it refers to teeth which need the services of a dentist. "Impactful" isn't even a word. That said, this is a very important advance. It's important to be able to make devices with this precision and accuracy in chip foundries.